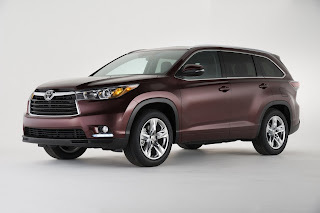 Top Cars | 2014 Toyota Highlander | Powertrain options include a fuel-efficient 4-cylinder, a powerful and capable V6, and a Hybrid Synergy Drive V6 for reduced emissions and enhanced mileage. 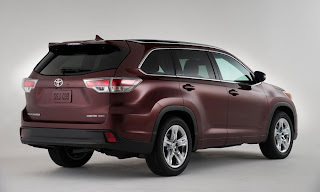 The all-new Highlander has been completely revamped inside and out, bringing more of an upscale style. Not only is the exterior more attractive, it’s functional with an aerodynamic roofline and larger rear windows for improved visibility. 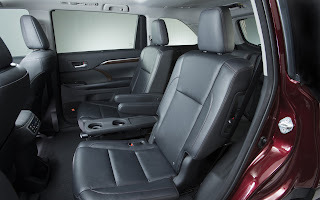 Inside, the cabin of the Highlander offers more standard features, space for passengers, and space for cargo. Drivers can enjoy the soft-touch instrument panel, backup camera, Bluetooth, and Entune touchscreen system which come standard. Passengers will love that the Highlander can now seat up to 8. But with more passengers, you’ll need more cargo space, right? Don’t worry, because there’s also a 34% increase of storage behind the third row seats.